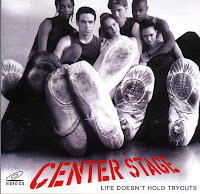 In celebration of International Dance Day I would like to talk about lots of important dance issues, but to be honest all I really want to do is go home and curl up and watch Center Stage*. For anyone who isn't a dancer (I will not entertain the idea of a dancer who hasn't seen it), Center Stage the story of Jody Sawyer, a plucky young ballerina who joins a workshop at the American Ballet Academy. The artistic director (Seth Cohen's dad from the OC) says she has bad feet, bad turn out, a non-ideal body shape and is generally clumsy, but with good friends (including Spock's girlfriend and Doc Ock's wife**) she succeeds anyway. It's a Cinderella ballet story, and I watch it whenever I'm feeling overwhelmed or under-motivated. I have occasionally left it on while blogging here or working on choreography and I've certainly watched it while I devoured chocolate and cried because I had a bad dance day. The first time I saw it I was thirteen and going through mad drama with school, friends and dance. It might be a silly little movie with questionable acting but I will probably always go back to it because it makes me remember why I love to dance and to be honest I think everybody forgets sometimes. I think you'll agree that the final show is a fine demonstration of innovative, meaningful choreography that manages to include motorcycles, Michael Jackson, bed frames and the all important red pointe shoes (a lifelong obsession of mine). I could really talk about this movie all day, because I love it for its cheesiness and how it makes me feel all warm inside. It seems like the best thing to talk about on International Dance Day. "I screwed up any chance I had back in September. But I started dancing long before this stupid workshop, and I'm gonna keep on dancing long after it. 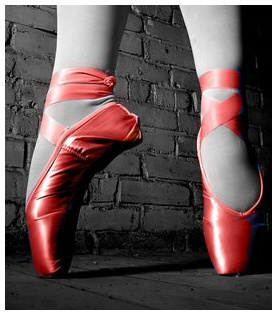 So tomorrow is one more day I get to dance." * But never Center Stage 2: Turn it Up. No, never that. ** Wow that was obscure, even for me. Sorry. hahah I was expecting this to be like a "I LOVE BEING IN CENTER STAGE" journal.